Mom is smirking at us. The smirk soon turned into a laughing fit. We looked at her like she was crazy. During her fit, she kissed me right on my nose and kissed my Lillian on her polka dot. Mom glanced at our teeth and said we need braces. I don't think she is seriously going to buy them for us since our teeth are tiny. Thinking back to when I was a small chap, I don't remember how my pearly whites started growing in different directions. Lily is actually missing one of her molars. I think that is a tooth in the back. Mom said she was chewing a hard bone when she spit out a cute little tooth. To her surprise, she placed the tiny thing under her blankie. When she woke up the next morning, she had a stuffie/baby as a prize. There are tooth doggy fairies after all. What we learned is mommies can be real jokesters at our expense. Ya know how human persons start lookin like their doggies? I bet she forgot about that! Giggles…BOL…. So who's perfect, right? We think you are even more adogable with snaggle teeth. We have snaggely teeth too and we like em! They come in handy on Holloween. Hi Benny & Lily! I came across your blog from dogswithbogs. You two are so adorable! My tiny teeth are snaggleteeth too. Oh Benny & Lily, we think you have beautiful toofies! Please tell Mom that in some cultures they knock out their front teeth to make them more beautiful!! You guys are quite cute! No braces for you! My teeth are crooked too, but they still bite pretty good. You are such cuties. I hear that braces come in all sorts of designer colors now. You might want to think on that. Maybe your little mouth is too small for those giant chompers. 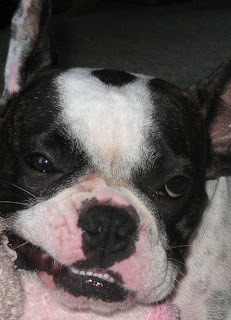 Benny, buddy.....my mom is whutchuh call a "dental highjeanust". She'll hook ya up! My teefies are crooked too! And our Lilly is missing more than a few herself! I also am in the snaggly tooth bunch. I think it just gives us more charm! Wheewww! I am glad lots of my friends have crooked teeth. I will pick everyone up in the van and head over to Brutus house. You have very cute little teefies!